Since the 1990s, external technology commercialization (ETC) has become increasingly relevant in business management practice and the academic literature. Frequently, ETC is praised as highly important and is often even considered an important competence of a progressive firm. To date, research has mainly focused on the opportunities and advantages of ETC, while risks and costs tend to be ignored or downplayed. This paper aims to review ETC critically. We stress that ETC might not only cause operating costs but also requires additional human resources. 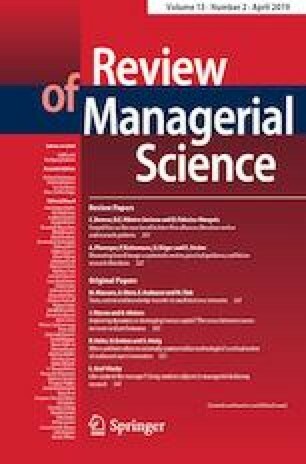 From a strategic perspective, we propose that ETC may result in the loss of competitive advantages through the disclosure of internal knowledge (or areas the firm is working in) or through the suboptimal allocation of R&D resources, and thereby affects a firm’s performance negatively. Finally, we propose specific implications for management and research on when and how often companies should practice ETC, and illustrate related practical experience by a case study. We thereby propose an inversely U-shaped relationship between ETC’s intensity and the firm’s profit contribution.